This fall, the Force can finally be with you  for a suggested retail price of $129.99. Put on a headset, focus on a small ball in a cylinder, and use your mind to make the sphere rise. It's cool, not to mention a little strange. Each toy includes a wireless headset equipped with forehead and ear sensors that read two kinds of brain waves  alpha and beta, naturally  then relay signals to the bases of the toys, triggering fans that cause the balls to rise. Mindflex's headgear comes with earlobe clips, which significantly increase the I-look-like-a-fool factor. The game requires players to move the ball sideways as well as vertically. There's a knob on the base unit that players must turn (the old-fashioned way, with their hands) while focusing to get the ball, for example, through a tiny hoop. 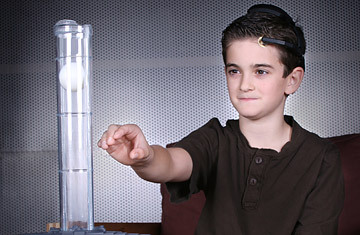 At the toy fair, a Mattel spokesperson joked that Mindflex requires "mind-eye coordination." The Force Trainer  which is limited to moving a ball up and down in a tube  may not be as complicated as Mindflex. But it does have Star Wars branding, which possesses a magical retail power all its own. The toy features 15 levels of training: increasingly difficult challenges involving how high to raise the ball and how long to hold it steady before changing its height. Along the way, Yoda and Obi-Wan Kenobi offer words of encouragement as hopefuls try to attain Jedi Master status. May your limited discretionary-spending power be with you. Read "The Army's Totally Serious Mind-Control Project."